In many ways, the American Southwest is a cultural crossroads, and it is artists who must provide the map. One creative spirit who can often be found at the intersection between music, spirituality, and movement is vocalist, dancer, and composer Solvei McKenna. Solvei originally hails from Oslo, Norway, but she embraces Latin, Native American and Scottish influences in her music. While she has called the the Los Angeles music scene her home since 2000, she has also established the band ZumaSol, composed primarily of Tucson-based musicians, for support when playing concerts in Arizona. 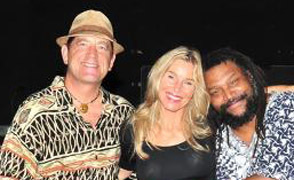 Solvei is quick to cite the support and collaboration that she enjoys with ZumaSol members Will Clipman and AmoChip Dabney as key to expanding her musical presence in Arizona. Solvei and her Tucson band ZumaSol will be perform a free show on Saturday, September 14th, at the Fox Tucson Theater. The group then heads to the Oldtown Center for the Arts in Cottonwood, Arizona for an appearance on September 28th. The Fox Tucson Theater is an underwriter of Arizona Public Media.